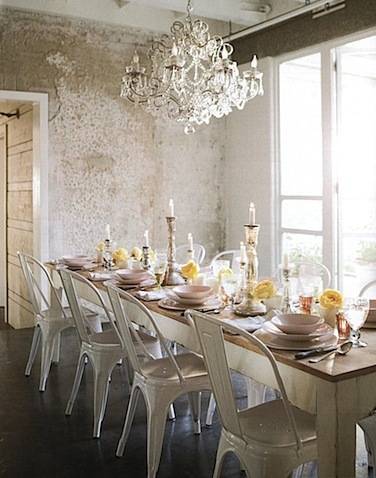 When Thanksgiving came and went it got me thinking about dining rooms. At one point, about 10 years ago they were a dying breed. Everyone was ripping out walls left right and centre, sacrificing dining rooms to make ginormous open plan kitchen/great rooms. Hmm, I love a great kitchen, but I also love a great dining room. What a luxury to have a separate space devoted to dining -- no dirty dishes or giant TV on view. I appreciate the ceremony of it all and love dining furniture. My favourite dining design idea of all is a dining room that does double duty as a library. The other interesting thing about dining rooms is that when I go through the exercise of sorting my favourites, the complete diversity of my personal design taste is laid bare. I'm going to start with my all time favourite -- I stray to different looks, but I always come back to this one dining room and I have never ever looked at it and felt anything other than -- that is gorgeous! It's by Gil Schafer. The colour, the chairs, the symmetry, the greek key trim, the books, the fireplace, the carpet: perfection. So, how is it possible, if that one is my favourite, that I also love every last one of these? The architecture, lucite table, chairs, styling. So chic by Timothy Whealon. SJP's Hampton's place by Eric Hughes. The table, mismatched chairs all painted matte black - inspired idea! Country home of House Beautiful ed in chief Newell Turner - I imagine he must have long leisurely weekend brunches here. Everyone I know loves this room. I am no exception. Rough meets pretty by Amy Nuensinger. Dreamy. Ina's barn. Sigh. Victoria Hagan. Table, chairs and art - love. Pendant, not loving but love other elements enough to make up for it. More handsome formality from Gil Schafer. The perfect setting for the costume drama of my dreams. Black tie Christmas dinner complete with roast goose and Anthony Hopkins serving, natch. 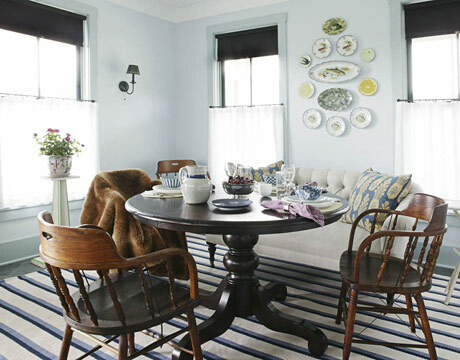 Leslie Klotz's light, bright, easy & breezy space. A dining room to serve summer produce and pass the salads family-style -- and keep the Pimms No. 1 cup coming. Technically a breakfast room, but Barbara Barry really got me with this one. A wood burning fire and comb back Windors warm the cockles of my heart. A dining space for stew and artisanal breads and cheeses. Darryl Carter's mastery of old + new + restraint fills me with awe. More Darryl Carter. This time his own DC place and technically a breakfast room. My affection for this place stems partly from an excellent memory of a wine-soaked evening sitting around this table. I sat right in that chair in the foreground. Delicious food and company. Promises were made about return trips to DC after that meeting, and an open invitation to visit Toronto -- but it has only been Christmas cards and e-mails since. Still, I feel sure we will cross paths again and it will be as if no time has passed.sources: 1. Gil Schafer. 2. Timothy Whealon. 3. Eric Hughes/ELLE Decor. 4. Newell Turner/House Beautiful. 5. Amy Neunsinger/House Beautiful. 6. Ina Garten/House Beautiful. 7. Victoria Hagan. 8. Gil Schafer. 9. Leslie Klotz/House Beautiful. 10. Barbara Barry/Veranda. 11 & 12. Darryl Carter/ELLE Decor.